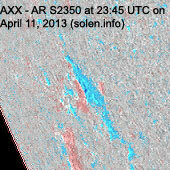 Last major update issued on April 12, 2013 at 04:20 UTC. 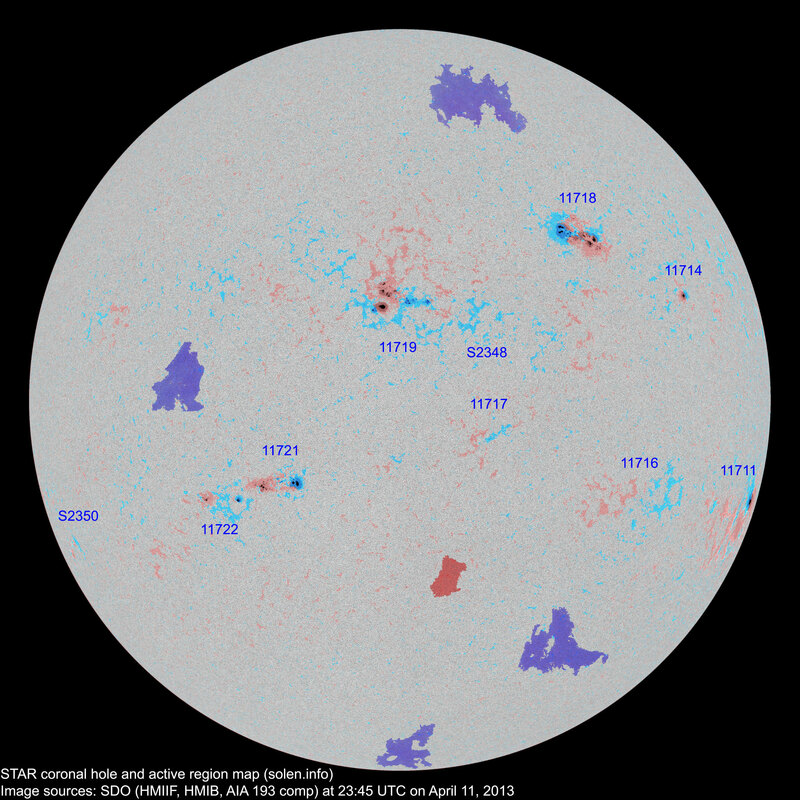 The geomagnetic field was quiet on April 11. 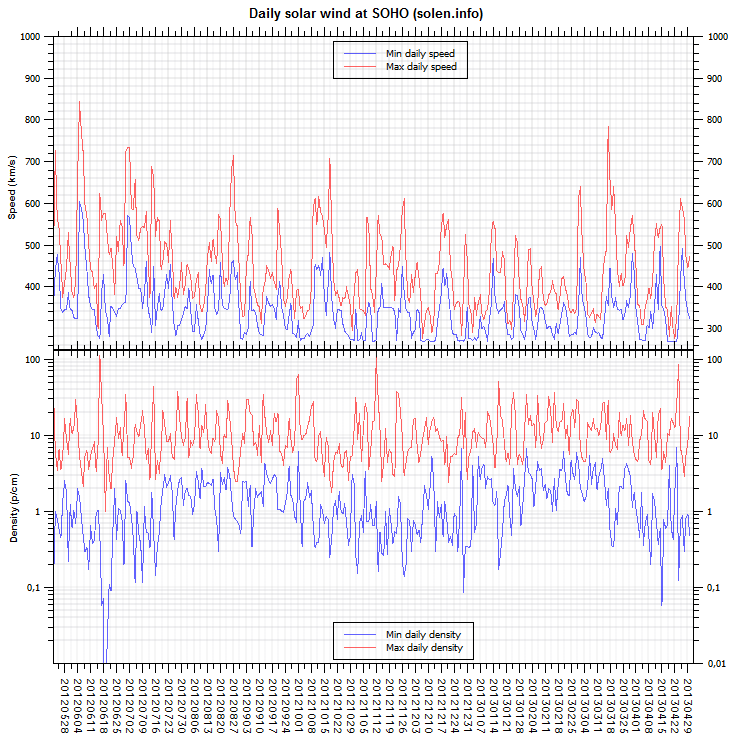 Solar wind speed at SOHO ranged between 352 and 515 km/s under the influence of a high speed coronal hole stream. 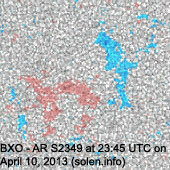 Solar flux measured at 20h UTC on 2.8 GHz was 137.1 (increasing 14.0 over the last solar rotation). 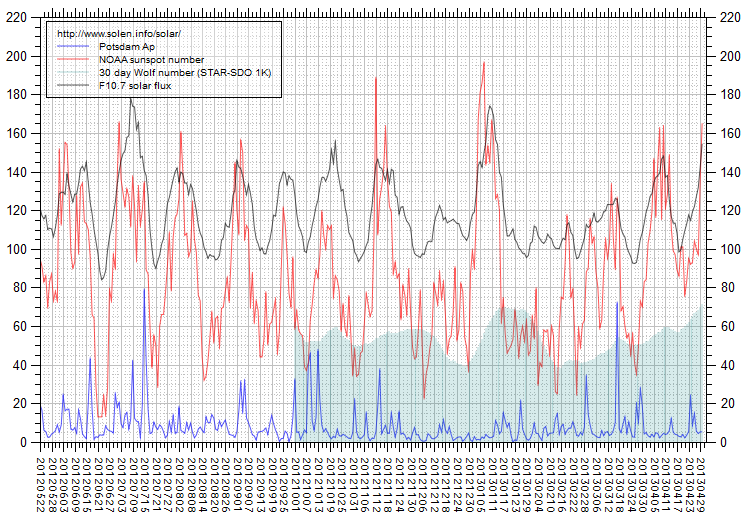 The Potsdam WDC planetary A index was 4 (STAR Ap - based on the mean of three hour interval ap indices: 3.8). 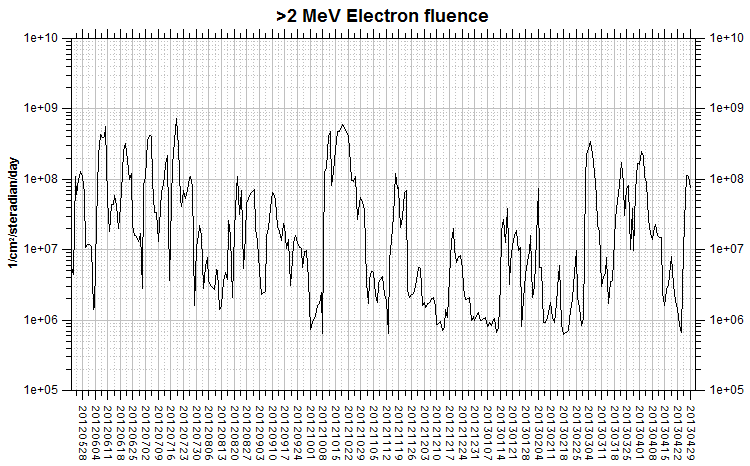 Three hour interval K indices: 10111112 (planetary), 01122312 (Boulder). Region 11711 [S17W81] decayed slowly and quietly. 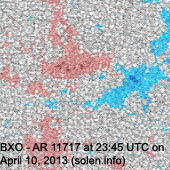 Region 11714 [N13W52] was quiet and stable. 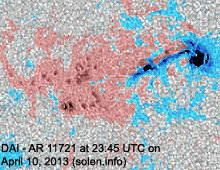 Region 11716 [S19W42] was quiet and stable. 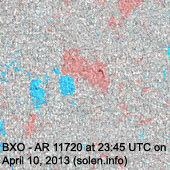 Region 11717 [S10W16] decayed slowly and quietly. 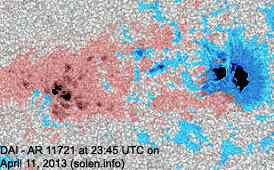 Region 11718 [N22W31] has many spots and a large penumbral coverage. 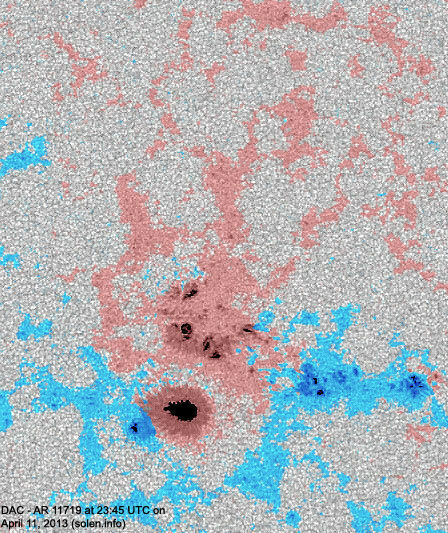 There is currently only minor polarity intermixing. An M class flare is possible. 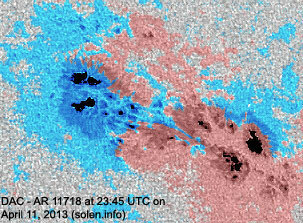 Region 11719 [N10E02] developed slowly with a magnetic delta structure forming in a trailing penumbra. Further M class flares are possible. 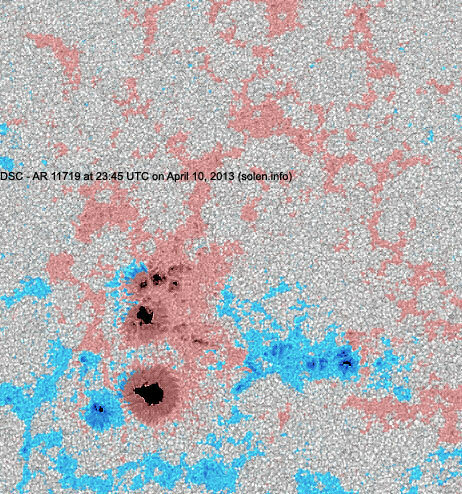 C5+ flare: M6.5/3B long duration event peaking at 07:16 UTC. 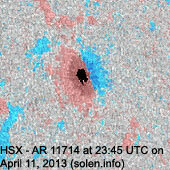 This event was associated with a wide, fast full halo CME and a significant increase in proton levels at Earth. 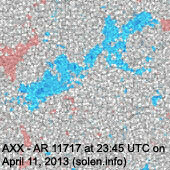 Region 11721 [S18E19] developed slowly and was mostly quiet. C flares are possible. 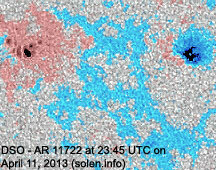 Region 11722 [S20E30] was quiet and stable. 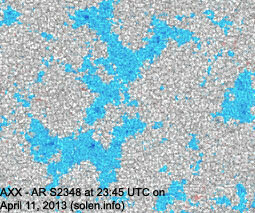 Region S2348 [N08W12] was quiet and stable. 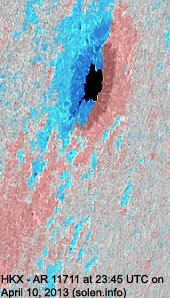 New region S2350 [S24E72] rotated into view. 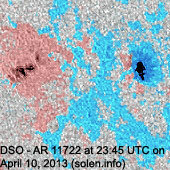 AR 11713 behind the northwest limb produced a long duration C6.0 event peaking at 10:46 and a long duration C4.0 event peaking at 23:02 UTC. 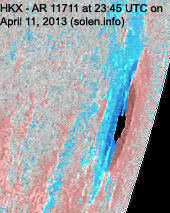 April 9-10: No obviously Earth directed CMEs were observed in LASCO and STEREO imagery. 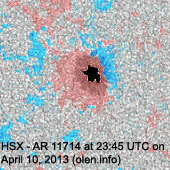 April 11: A fast full halo CME was observed after an M6.5 LDE in AR 11719. 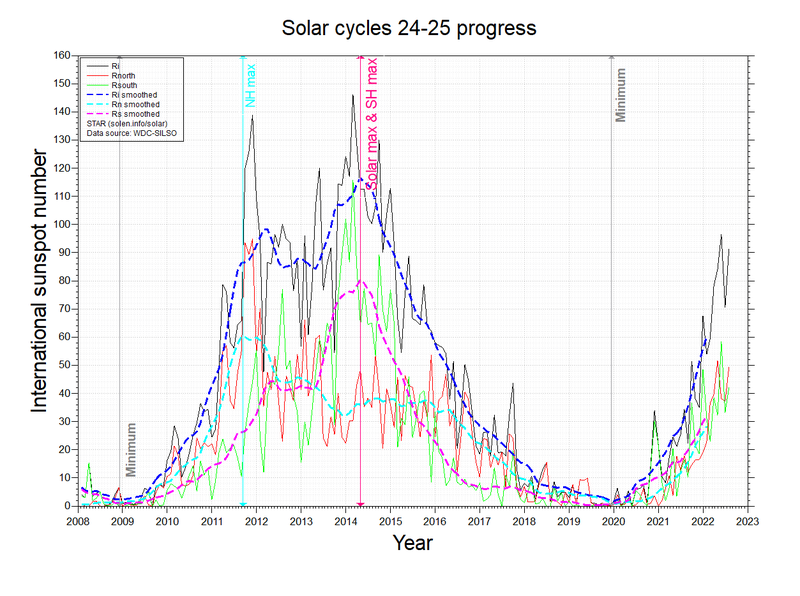 The CME could reach Earth during the first half of April 13. 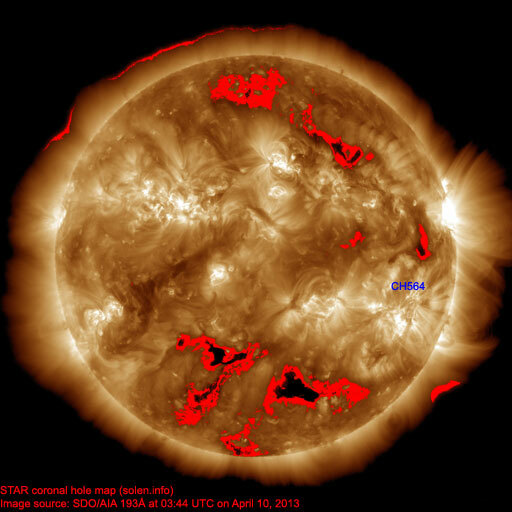 No obvious coronal holes are currently in an Earth facing position. 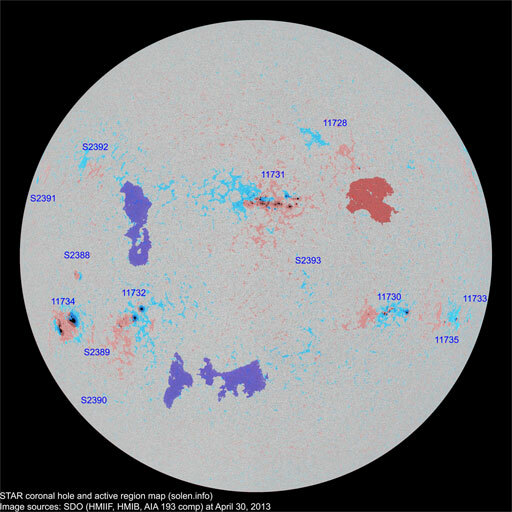 The geomagnetic field is expected to be quiet on April 12. 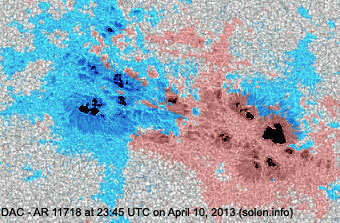 A CME could arrive early on April 13 and cause minor to severe geomagnetic storm conditions lasting into April 14.